"Problem child" Ash Blake is nothing but a nuisance to his fellow students at Ansullivar Dragonar Academy. Sure, he's got the sacred star brand that marks him as a future master of dragons, but his lack of dragon companion and hot temper make it more than a little difficult for him to play the part of the hero. That is, until his dragon awakens, and he's finally partnered with a fierce, fire-breathing... cute girl? And her human form isn't the only surprise; she's determined to be Ash's master. But when dark forces begin to endanger the lives of dragons and students, Ash and his partner must find a way to work together to defeat them! 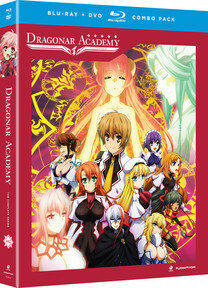 Contains episodes 1-12 of Dragonar Academy on Blu-ray and DVD. Special Features: Episode Commentary (2, 7), Commercials, Promotional Videos, Textless Opening and Closing, U.S. Trailer, Trailers.